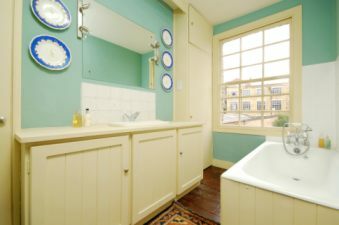 The bathroom is one place where most period house owners have to compromise; we want as large a space as we can manage. Note the white fittings and dark-stained floor but with paint colours that would have been available in the early Victorian period. A common question is how can I restore a cast iron bath? Vitreous enamel is the same as the original surface put on the cast iron. The existing enamel is sand-blasted off. The new enamel is baked on in a kiln with a temperature of 1100°C. As this is the most expensive option, it is really only appropriate for a very special bath. Professional bath resurfacing companies may repair a bath on or off site. The new finish is typically epoxy resin or a polyurethane coating. With care, it may last 10 years. The DIY option involves degreasing the bath and scrubbing it with an abrasive to give a good key. Any chips must be filled with an epoxy filler. Dry the bath thoroughly. Ideally remove the taps and waste fittings, or else cover them with masking tape. Make sure the taps will not drip. Use several thin coats of the coating, using a brush for awkward areas and a roller for the rest. Do not use the bath until recommended; this is usually 48 hours. This method will not last as long as professional resurfacing. For the two resurfacing options, you must take care when cleaning the bath subsequently; use cleaners recommended for acrylic or fibreglass baths and nothing abrasive. If you have chipped a sink or toilet, you can make a serviceable repair with epoxy putty. This comes in a two-part kit. When mixed it begins to harden but will still be workable for at least 45 minutes. Press the putty into place, smoothing it with a wet finger. Once it has hardened, use files and abrasive papers, progressively finer, until the surface is smooth. As a glaze, use a cold cure lacquer. Again this is a two-part product. It is available in white, but use a clear version for the final coat.